Delays: As Important as Testing? In a previous blog post we discussed the importance of testing, but sometimes delays are just as important. Right now for Morpheus the best decision has been to slow down and analyze our systems before testing again. As we progress through our schedule we have certain milestones we have to reach. In our current phase, we will test as necessary to learn about our vehicle and subsystem performance. This will help us evolve the vehicle design and meet the milestones leading to conducting high-energy flights next year. Don't think that the team has been sitting idle waiting for a few teams to problem solve. For example, the GN&C and software teams has been taking advantage of this time to pour over the large amount of test data we have already collected. They have used this data to improve the control layers and Morpheus simulation. 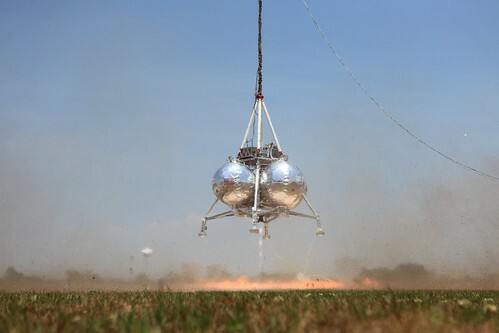 These updates will be tested soon (possibly as early as August 31) in another tethered test (#6) of Morpheus. These two groups along with all the other subsystems have also been busy looking into upgrades for the next version of Morpheus, referred to as Morpheus v1.5. Besides upgrades to existing systems, this also includes the beginning of integration with the ALHAT (Autonomous Landing and Hazard Avoidance Technology) Project, an important step in our development as a lander prototype. Below is a video summarizing our current progress using tethered tests, which have been invaluable. This team has been able to design, build, and then run 4 hot fire and 5 tethered tests all in less than a year. It shows the advantages of following lean engineering and management practices and these recent delays should not cast any doubt on that. If anything they prove that lean practices still follow the appropriate levels of safety and configuration control allowing us to determine solutions to problems as they happen.